2 out of 3 children are failing to achieve proficiency in reading. That's not a typo. 2 out of 3! And students who cannot read proficiently by the end of 4th grade are four times more likely to drop out compared to proficient readers. Even more disturbingly, 2 out of 3 will end up in jail or on welfare. 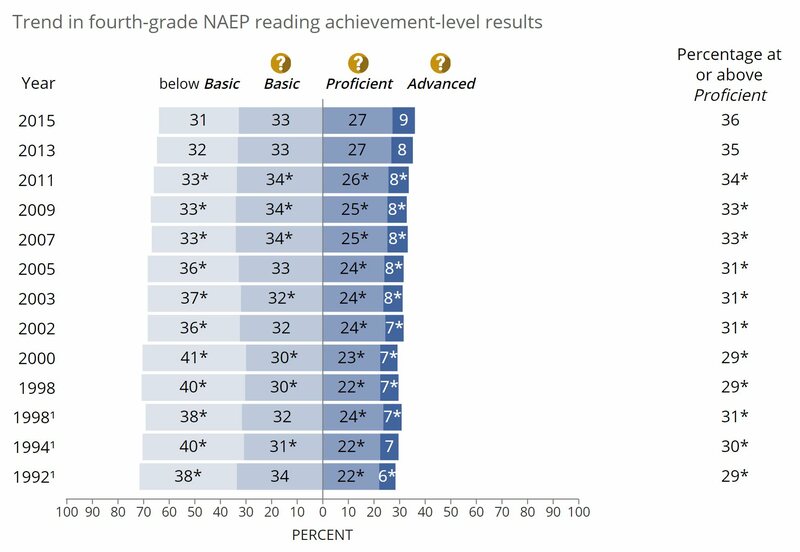 As you can see in the chart above, over the course of 20+ years, the National Assessment of Educational Progress has shown 1 out of 3 students at "below basic", another third at basic, and only one third at proficient (with only 8% at advanced). This is 4th grade reading - not rocket science! Next: Find out why so many kids are failing.